With autumn approaching like a falling leaf to the ground, it is time to think about transitional pieces to balance the bit of evening chill in the air. For me, the cowl is just such a piece since it stays in place, adds a bit of color to any outfit, and can carry you through winter into spring. Here is my Taffy Twist Cowl knitting pattern on Ravelry. • A video showing both the Russian Join and the Felted Join thanks to Abigail’s Crafts How To. • surprisingly stretchy bind off. 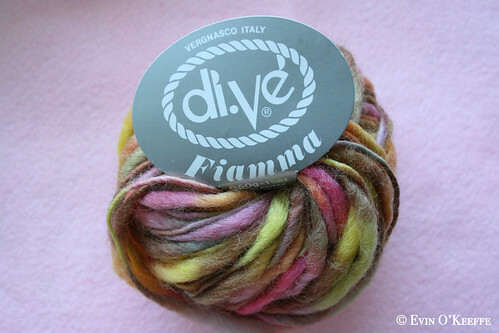 If you like Di.Ve‘ Fiamma, it is available from Knitted Together or you can hunt for it on Ebay. It is soft – very soft. Though it goes from thick to thin, it is strong and sturdy. I never had any breakage though keeping it from splitting while I knitted in the dark watching a movie was occasionally a challenge. The colorway is delicious! It reminds me of the rainbow swirl mashmallows some gourmet cafés serve in their hot chocolate. The care allows for hand wash in luke warm water, but I think blocking after any dampness or washing is recommended to retain your pattern’s desired shape. I’m grateful to have eight more skeins of this in two colorways to play with. Please please comment here or on the Ravelry pattern page if you end up trying this cowl pattern. Of course, you can also comment for fun. This entry was posted in Knit Scarves & Cowls, My Knit Patterns, Tutorials | Patterns and tagged cowl, cowl pattern, crafts, free knitting pattern, free knitting patterns, how to, Knitting, knitting patterns, sewing, twisted cowl, upcycling. I love the description for the colours! Almost makes me want to taste the yarn! I did something similar outnof handspun thick’n’thin yarn. It ended up being Rob’s cowl because he liked the colours so much. The one I made had more purple in it. “Hello” from the east coast of Canada. We’re still in Halifax, NS but our time is nearly at an end. We go home on Wednesday. That is so beautiful and so stylish! Twist only once means that when you would join in the round with the stitches lined up exactly, you would twist the stitches once so they are joined in the round perfectly lined up but offering a little spiral to the rows you’d then knit. It will not effect your knitting. 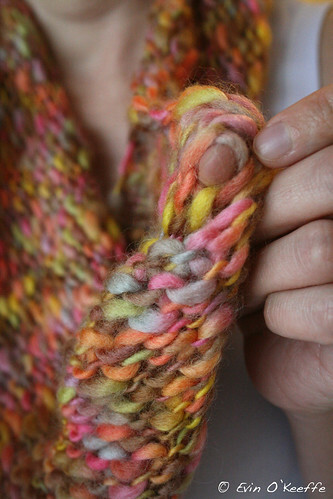 Not twisting still produces a lovely cowl. can you help me please? I think it’s beautiful! The pattern is within the text of the email at the moment. I will add a pretty PDF soon. This is beautiul. Am going to do this one. Have made different cowls, but this is delightful in its colors and textures. Love it! I am really having a hard time finding the color and di.ve yarn. Where would you suggest that I get it? Thank you for your time. I did see that you said to check Knitted Together or Ebay but everyone seems to be out of it right now. I will keep checking.